“There are no words that can aptly express the depth of appreciation we have for Bekka’s guidance during our wedding planning. Hiring Bekka was by far the best decision we made during our wedding creation process, and we are now richer for knowing her. We had envisioned a weekend-long celebration of love and community in Northern California amongst the redwoods, and had a lot of over ambitious ideas, with no practical way of pulling it off…until Bekka got on board. She swiftly and lovingly brought our vision to life, and I’ll never fathom how she did it. 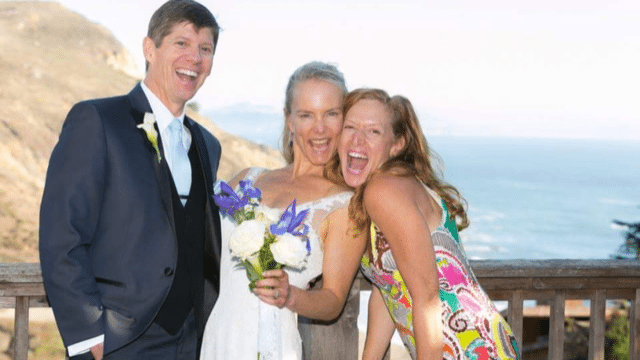 There is no way we would have been able to create the magical, joyous, love-filled, beautiful weekend of celebration and unity that we did without Bekka’s skilled direction. Bekka has that rare combination of intuitive, joyful, spiritual, creative, loving energy combined with strong leadership and real-world organizational skills that make her a rock star, heart-centered event planner. And if there is a limit to how far Bekka will go for her clients, we certainly didn’t reach it – and we truly tested the limits. Bekka, thank you for bringing the magic with you that weekend, and for the whole time, you worked with us (I’m sure it’s in everything you do). Enlisting your help was our first gift to ourselves as a married couple, and it truly started our life together off right. We’ll never forget all you did for us. “Working with Bekka on our wedding planning and having her as our coordinator during the wedding weekend — was a Dream. Come. True. We don’t know what we would have done if not for her presence, and we cannot imagine another person who would have done the job like her. We were already family friends, but we were so grateful to become closer with Bekka in this process. We wanted to do a lot of the initial work and planning ourselves, and really appreciated Bekka’s “Goldilocks” just-right level of creative input. She always deferred to our taste, our choices, and creativity when we really knew what we liked. When that spark wasn’t there for us or we were unsure, we could call on her for support or brainstorming. We met with Bekka regularly to keep us on track; to be a third (more experienced) opinion as we made decisions; to make sure we were staying in good communication with each other and our vendors/other contacts for the wedding, and to be a reminder of what’s most important in this extremely meaningful commitment ceremony. We loved how Bekka pushed us to stretch our comfort zones a little and to ask for help from our community. 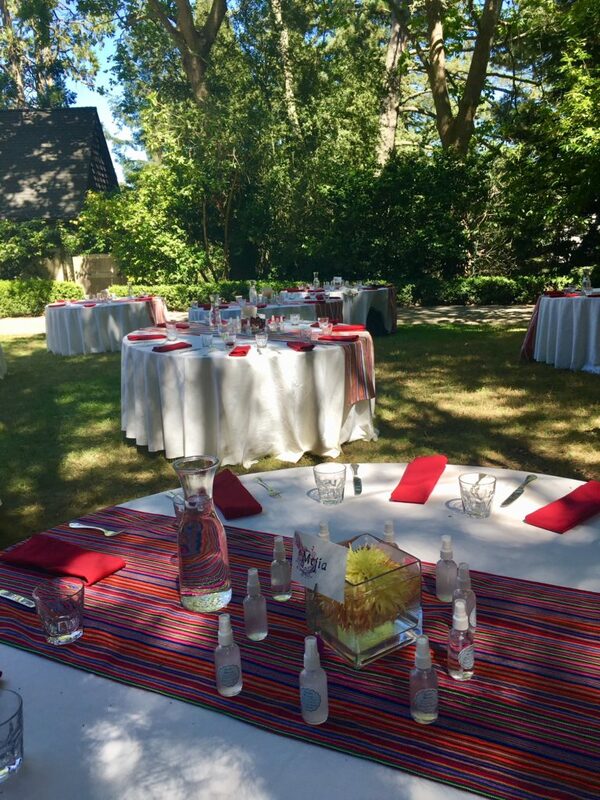 We ended up having the most loving, warm, community-built workdays before the wedding at our venue, and a really pleasant clean-up day afterward. We found lots of creative ways to make the most of our budget while focusing on the aspects we cared most about and not compromising any quality. There are no set rules when planning Your special, sacred day — and Bekka will help you clarify Your rules/boundaries/visions and be the wind beneath your wings to manifest events and enjoy yourself at them! We are so, forever grateful and blessed to have worked together with Bekka. "I've worked with Bekka and her team now for years. Even a short session with Rockstar Organizers feels life-changing. Sure you could do it yourself. You've probably been saying that to yourself daily or weekly for years. Bekka and co move you through years of procrastination to create an orderly, clean system for your things that is easy to maintain. Bekka brings a refreshing cleanliness not only to your home but to your mind and soul. I got so much more accomplished and freed an amazing amount of space in a few short hours. I highly recommend her team's service to create more creative space physically and spiritually in your home." “My wife and I moved into our Berkeley home at the turn of the millennium. 16 years, three kids, and 457 Amazon deliveries later, my work took us to Berlin for a year, so we called on Bekka. Actually, it would be equally true to say that after 15 years, three kids, and 412 Amazon deliveries I called Bekka, then a year later contrived a move to Germany so I could have an excuse to work with her. Let's just say I'd heard glowing reviews from a friend about Bekka and was very eager to collaborate, and a big international move seemed like a great time to do it. And she was absolutely indispensable. We had very little time to make it happen, since I'd moved ahead to Germany and was returning for less than a week to pack up the house and family and ready the place for our tenants. Not since the actual Berlin Airlift has a trip there been so meticulously planned and executed. Bekka worked with us a couple of months before to get the lay of the land and do some early prep. Then came the real work: forcing us to make a hundred (a thousand?) little decisions about all the junk we'd accumulated over the past 16 years, and this was her magic! She knew just how much to push, and mediated between my wife and my divergent organizational styles brilliantly. She hired the appropriate staff to help at the appropriate time, and the whole thing went off remarkably smoothly. To top it all off, Bekka is as hands-on as the come. She took on black widow spiders in our shed and expired food in our earthquake kit. Nothing phases her! "Working with Bekka has literally changed my life. Over the course of the last six months I've transformed my home and my office from heaviness and clutter into a light clear energy with things out of sight and systems in place so I can keep up the organization. I love how it feels to be in my home now. I've brought abundance into both my business and personal life I'm a changed person. I think of myself as a tidy and organized person now, and I go about my day with that as my guiding principle. I feel lighter and enjoy being in my home, having people over, and I never want to go back to the way it was before. I loved how Bekka was patient with me through the process. I didn't get to this place overnight, it was a step by step process of transformation and evolution, not just of the physical space in my home/office, but also in my own definition of self. It's that transformation that took time between sessions, but will make the work we did together stick and grow into MORE. I can't thank Bekka enough and would recommend her to ANYONE who wants less clutter and more clarity, joy and abundance." "I have wedding envy!' one of our guests laughingly said as she left the rustic beachside building that Bekka had magically transformed into a communal ark, transporting two of every kind of family together on a six-hour voyage of love. "Best wedding ever," dozens more of our guests have remarked many times since. And while it's true that we shared our wedding with an extraordinary group of people who would have made any event special, Bekka's leadership and organizational wizardry made the celebration memorable not just for us, but for every one of the 104 people who she enticed into co-creating something extraordinary. Building on the "community" theme we wanted, Bekka crafted a setting tight enough to bring us all together, but loose enough to encourage everyone feel included by bringing a cake, sharing a poem, hanging decorations, making a video, or just bonding with someone new. Drawing on boundless supplies of amazing organizational skills, joy, good humor, flexibility, resourcefulness, energy, and compassion, Bekka kept everything and everyone moving forward, but without the slightest sense of strain or control. Plus, we were so confident (rightly) in Bekka's ability that neither of us had to think about a single detail. Everything went so smoothly she found time to photo bomb one of our wedding pictures, and get even more people out on the dance floor. From the bride: "I was so appreciative of our fun, inspiring planning sessions because initially I felt overwhelmed by the level of detail. Bekka magically took care of all of those. It was the perfect wedding, and the perfect planning." From the groom: "We can't say enough good things about Bekka and her ability to create magic. She helped make our wedding not only memorable for everyone, but memorable for how beautifully it unfolded." Bekka, along with one of her amazing assistants, spent the day with me opening boxes, laying everything out on tables and systematically going through it all. They periodically spritzed me with water to rejuvenate me and then hauled it all away at the end. Magic, I tell you, pure magic. She had the energy I didn’t to tackle the project. There was also a great system and working relationship with her assistant to keep things moving all day. She was sensitive when I needed to take a break and process what I was abandoning and what I needed to keep. Her intuition and guidance about letting go in order to move forward and create the energy and feelings I want in my home and my life are authentic and impeccable. Her ability to prioritize, organize and effectively purge are top notch. I had a friend staying with me at the time. Once the day was over, we went to the beach and as we walked back in the apartment she turned to me and said, “Wow, they were a force, the energy feels completely different in here.” I am truly grateful and have recommended and will continue to recommend Bekka to friends." "Bekka worked magic. I had been in my condo just a few years but had boxes of papers and memories, file cabinets, and clothing that hadn't been sorted for at least a few moves. Yes I went through my home and got rid of tons and tons of unneeded things (and she carted it all off so I didn't even need to make the Goodwill trip.) But more than that - I was able to get through the process without feeling overwhelmed, without getting bogged down in the memories or in the clothing - just efficiently and effectively letting go of what was no longer needed. And that was the magic - with Bekka - it wasn't just about the stuff (though she was a master at handling that) it was Bekka's intention, inspiration and compassion that made clearing out my home such a release - and a deeper letting go of unneeded things. Was my home cleaner and way less cluttered - absolutely! But the magic was in the way it also felt lighter and happier to walk into when she was finished (and still does over a year later). Thank you for your magic, Bekka!" "Bekka is unbelievable. She totally transformed my garage from something out of "Hoarders" into a neat space where I can find everything and have plenty of room for hobby projects. Inside the house, she reorganized (much needed after moving) and put in a system that is very easy for me to maintain. Now I am able to get much more work done." "Bekka has that rare combination of qualities: funny, artistic, creative, yet organized, efficient and to-the-point. She has helped me organize my space twice, clearly paying close attention to who I am as a person and what kind of help I need to move forward. She flew through the place helping me sort, file, dump, and ..for me very important...process the whole experience in a meaningful way for personal growth. That was not just icing on the cake, but part of the service that she offers. How else can one prevent immediate regression back into messiness? Just a delightful and skilled human being who thrives being of service!" "Working with Bekka is like giving your home a massage. She soothes environmental tension spots in your space that affect your life and work. This happens by freeing up the physical stuck points in your home or office by clearing and reorganizing then Bekka coaches you in acclimating to the adjustments made in your space. With Bekka's up-beat,empathetic and non-judgmental energy, it's always a pleasure to have her come over to tune up my life and workflow." "If you need someone to come in and make things happen, Bekka Fink's the one. She was a force the last time I moved, helping with everything from packing to hauling, purging what I didn't need and keeping everything positive. I most appreciate how Bekka is thoughtful about where things go - you're giving away clothes, furniture, or things that don't work anymore, and she makes sure they end up in the hands of people who want them or properly recycled. She's not afraid to see what's emotional about "things" - the things that clutter our lives - but she will also stick to the practical details and simply move things along. She is flexible and can surely adapt to whatever project you have waiting." "Bekka came into my apartment and rocked its world! Literally, we decided to attack my bedroom closet and within 4 hours, we pulled every single thing out. Bekka lovingly yet forcefully made me think through each item before it deserved a place back in my closet. (Otherwise, found it's way to Goodwill or consignment.) Material possessions can be often hard to part with. Bekka is intuitive and can tell when she's taking you in a direction that causes angst. She can sense the emotional attachment and has a powerful, sensitive way in helping her clients work through decisions that are in the best interest of the client (it may be to keep it, or move it, or in other cases, to part with it). The results are obvious and efficiently achieved. I highly recommend Bekka for any organizing job you have. Her energy and work is fabulous! Just be prepared to be left with an incredibly organized space." "Bekka has been a true gift from the universe for me. I was in the process of cleaning out my loft to sell, and needed a thorough purging of all the stuff in my place. I had no idea how to start. From the moment Bekka walked into my loft, she immediately began transforming the place - spiritually & spatially. She took a real keen interest in learning about me (her client) & my goals before organizing my space. It was not a 'cookie-cutter' approach, and I knew I could trust her to respect my space & stuff. She frequently checked in with me on status/progress to ensure we were on track, and that my needs hadn't changed. It is a true collaborative approach. She gave me digestible assignments that even a clutter queen (like me) could complete, like, "can you get rid of 5 books this week?" vs "let's go thru the library & remove what you think you no longer need." She handled everything with care. She is consultative, not forceful. She was very flexible in her scheduling with me to meet my timeline. I have learned much from working with Bekka about purging stuff out of my life. Recently, I looked at a t-shirt & remembered Bekka's process, and it became easy to throw it out. My loft today is showcase-ready, and I owe it mostly to Bekka. I will recommend anyone to meet Bekka to see if she's the right organizer for you." "Bekka has an incredible ability to transform clutter and chaos into order and beauty - at warp speed. She brings a unique combination of high energy, fun, compassion, and a no-nonsense approach to letting go of what doesn't serve you. Her work goes so much deeper than just the physical space. I've engaged Bekka's services on several occasions - each at times of major transition (like having a baby, for example), and each time she's felt like a lifeline and left me feeling more effective and peaceful - not just in my environment, but in my life as a whole." "My experience working with Bekka was trans-formative. As I had never met with someone in this fashion with regards to my personal life and goals. I was, at first, a bit skeptical about what results I might gain. Bekka is so welcoming and warm that I instantly felt comfortable in her presence and was able to work through many personal fears and insecurities. Bekka's way of providing a range of support, from massage and body work when stresses become physical to written reflections, book recommendations, and more spiritual practices allowed me to feel like all components of my personal needs were being considered. I was able to gain new perspective on family and personal relationships which had been causes of stress for me for many years and which now bring me joy: a transition I could not even have dreamed of." Well, that one day, led to another, and suddenly, we had done virtually the entire apartment. Suddenly, I could see my large desk, all of the counter space in the kitchen, and yet, we still managed to fit everything, and even have…hold your breath…an EMPTY drawer for mail or whatever I see fit to put in it! The greatest gift of all…was the lightness I felt after that first day – just the sheer 'space’ I could feel as I went to sleep that night was amazing. It really is true that your world is lightened. A few weeks later I had a holiday party, and got more compliments on my entire place...It was a great feeling. As I said to my mom, there’s nothing left on my ‘To Do List’ any more. I’ve done all the sorting, editing, tossing, and now things don’t build up as much because I have a system, and I like the way the openness feels. In fact, I liked it so much that I gave my brother a gift certificate of Bekka’s time for his apartment, and have since referred her to a few other friends in need of some clearing out of the air!" "Thank you for your amazing support in transforming my living space. Your confidence, creativity, and intuition helped me let go of items no longer serving me, thus bringing joy and ease back into my home. You are a Rockstar Organizer all the way! Bekka is amazingly intuitive and acknowledging of each person's emotional attachment to their things and their space while holding room for people to move through their "stuff." Bekka can be quite clear on her task and move swiftly and efficiently while honoring each person's individual process." "I hired Bekka to help with a very large file organizing project for my clients. This was a very complex project that required a lot of attention to detail, and Bekka was thorough and fast working through-out. In the process of moving the files to their new home in another room we were left with an old room that was full of years of accumulated clutter. Bekka took one look at the space, saw what could be done, and went to work. At the end of the day the entire room had been sorted through and organized, an enormous job. What used to look like storage, was transformed into a beautiful guest room with photos and keep sakes displayed to their best effect. This was above and beyond what I had hoped for, and she did a marvelous job. Bekka brings an astounding amount of energy to her work. She works fast, digging into chaos hungrily where most people would feel discouraged and overwhelmed. Beyond being an excellent organizer, she has a talent for creating a space in such a way that it feels good to her clients, a space they will love and will *want* to spend a lot of time in. What a gift! Bekka really did an amazing job. She was fun and easy to work with, and did an impressive amount of work. My clients use that room all the time, and it's hard to remember it was ever any other way." "Bekka, I always knew that you were a natural Personal Organizer. I got to witness, however, just how talented you really are when I worked with you last year. With your support, I won back my precious personal time, increased my productivity in business, and lightened my load -- which I know results in being open to new possibilities and relationships. I was getting stuck in a common cycle that is bad for my business and personal life. I was feeling bogged down. As more and more stuff accumulated, I had less and less energy to dig myself out -- especially since I run my own business and come home spent. In a single day, you facilitated a serious purge and helped me put well-designed systems in place. You have a strong hand and a soft touch. With your guidance, you helped me get rid of so much more than I would have ever done alone. In the process, you also taught me how to maintain a more streamlined life and business. Thank you so much. As I put the finishing touches on opening my new office downtown, I am going to need your help again ridding my personal space from the influences of work!" "Working with Bekka was a tremendous surprise. I expected to feel more organized after working with her, but her intuition and care made the whole process and outcome also very satisfying and nurturing. She came over, we spoke for 15 minutes, and off she went. She checked in on a couple of things and then I left for an afternoon meeting and dinner. I walked in the door 5 hours later and burst into tears. The house was lovely. She had my candles burning, gentle music on, the living room and office were spotless, all the piles gone; it was clean and orderly, yet very homey. Bekka's work felt like the most caring gift I'd given to myself. I used to walk into my house and just try to tune out certain areas, and now I feel in control with simple systems I can manage. She also set up and did all my filing, which I never would have done on my own! Her intuition is truly amazing. I've recommended her to all my friends, and my mother wants to fly her to Connecticut to help with her house." Bekka's masterful at walking into a cluttered space, and in a matter of minutes or hours bringing a great degree of order, and also beauty. She's done this well for my office space – and also for closets, utility rooms and other clutter-zones in my home. On major projects, Bekka and I whip out the flip-chart or writing pad, and co facilitate our way through a game-plan for managing the project. She's rigorous at helping me to identify what I need to take on, and what I can pass off fully or partially to her or others. Then she takes her pieces and does them meticulously, while also checking in periodically on my progress – and offering support in places where I might be struggling. Prime example: I started a new nonprofit in the beginning of 2008. We had a huge inaugural series of events at a major international conference in a distant city. I got in over my head in planning a few events. Bekka took on key facets of overall logistics coordination – from dealing with conference center facilities and catering issues; to coordinating the production of substantial presentation packets; to using her networks to find – and then prep for action – a phenomenal on-the-ground logistics coordinator for me at the conference itself, to help me coordinate the activities of 20 panelists and a film crew over four days. If Bekka hadn't sat me down, compelled me to see that I was in over my head, co-facilitated a game-plan of action with me, then handled major portions of that game-plan with excellence – without all of that, I would have been sunk, and our major inaugural project would have suffered tremendously. As it turned out, it was a huge success – in large part because of Bekka's efforts. I love working with Bekka. She brings energy, focus, clarity, panache, and so much more. It's especially important to me that she comes from a place of her own power. Part of the reason I generate clutter and disorganization is because I've got some entrenched, unconscious habits that don't serve me well – and I can resist unlearning them. It takes someone who can be gentle where appropriate, but also firm where appropriate, to help me transform those habits. She knows where to challenge and push me, and sometimes in very demanding ways. She also knows when to back off. Her capacity to play this range is in part a function of roles (I'm not her boss, I'm her client), and in part a function of personality types. If you're seeking a "yes person" who's going to leave you stuck in your self-sabotage patterns, she's not the person for you. If you really want to make some breakthrough strides, call her. Bekka's rates are towards the top-end of the market – and deservedly so, because she's top tier. The return – in terms of order, organization, getting things right the first time, efficiency, success, peace of mind – is well worth the investment.